Any collection of short stories which rates a "Must Book" classification is on the face of it exceptional. But then, we happen to think that John Steinbeck is one of the bright and shining lights in our literary horizon, and that he can do no wrong. Each story is a gem. His very clarity of insight and selectivity of detail makes him memorable in the field of the novel and "a natural" in the field of the short story. The title simply designates the general locale of the stories. The characters once again show Steinbeck's closeness to the people of whom he writes, the country people, the old and the young. Many of the stories have appeared in periodicals. They still stand rereading. The Red Pony is the only long story included, and this volume makes it available for the first time at a standard price. 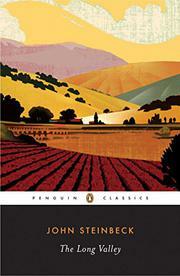 A book for the Steinbeck followers, a growing market, and for anyone who likes short stories at their best.